Sarah Nader - snader@shawmedia.com Erick Thornton of Northbrook helps plant one of 50 Oak trees at Merryman Park in Woodstock Saturday, Oct. 7, 2017. 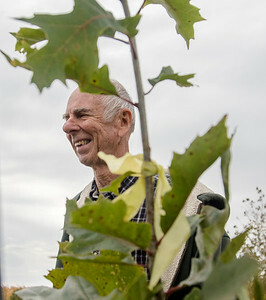 50 Oak trees were donated by the Thornton family in honor of Ted and Judy Thornton's 50th wedding anniversary. Sarah Nader - snader@shawmedia.com Surrounded by Oak trees Judy Thornton (left) of Crystal Lake and her husband, Ted, pose for a portrait at Merryman Park in Woodstock Saturday, Oct. 7, 2017. The Thornton's celebrated their 50th wedding anniversary this year and their family gifted them with 50 oak trees that were planted in their honor. Sarah Nader - snader@shawmedia.com Katie Parkhurst and her husband, Nick Parkhurst, of Woodstock help plant one of 50 Oak trees at Merryman Park in Woodstock Saturday, Oct. 7, 2017. 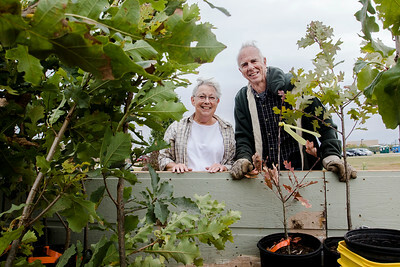 50 Oak trees were donated by the Thornton family in honor of Ted and Judy Thornton's 50th wedding anniversary. Sarah Nader - snader@shawmedia.com Ted Thornton of Crystal Lake helps unload Oak tree at Merryman Park in Woodstock Saturday, Oct. 7, 2017. 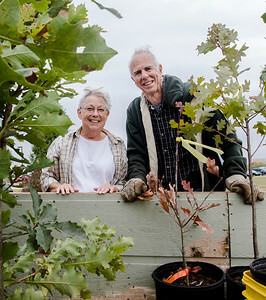 50 Oak trees were donated by the Thornton family in honor of Ted and Judy Thornton's 50th wedding anniversary. 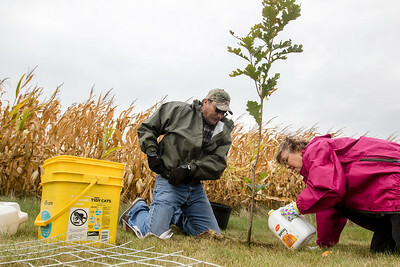 Sarah Nader - snader@shawmedia.com Kevin Likens (left) of Dallas, TX and his wife, Leslie Likens, help plant one of 50 Oak trees at Merryman Park in Woodstock Saturday, Oct. 7, 2017. 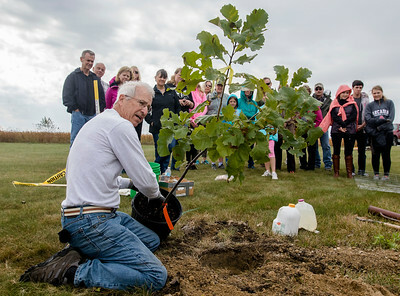 50 Oak trees were donated by the Thornton family in honor of Ted and Judy Thornton's 50th wedding anniversary. 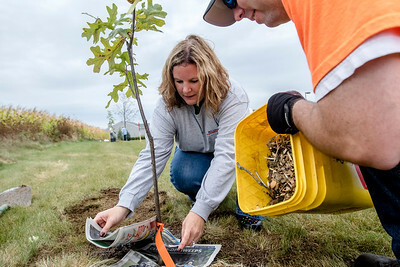 Sarah Nader - snader@shawmedia.com Dave Zeiger, oak conservation outreach specialist with The Land Conservancy of McHenry County, teaches the group how to plant an Oak tree at Merryman Park in Woodstock Saturday, Oct. 7, 2017. Sarah Nader - snader@shawmedia.com 50 Oak trees were planted at Merryman Park in Woodstock Saturday, Oct. 7, 2017. 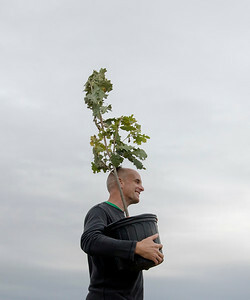 The Oak trees were donated by the Thornton family in honor of Ted and Judy Thornton's 50th wedding anniversary. Surrounded by Oak trees Judy Thornton (left) of Crystal Lake and her husband, Ted, pose for a portrait at Merryman Park in Woodstock Saturday, Oct. 7, 2017. 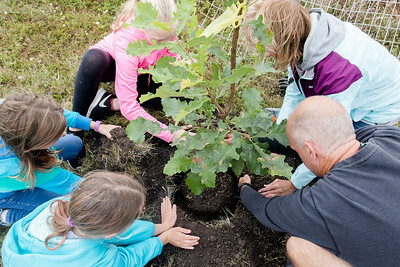 The Thornton's celebrated their 50th wedding anniversary this year and their family gifted them with 50 oak trees that were planted in their honor.